Working under pressure is no fun. But if you’re an autoclave, you work best under pressure. In fact, you only work under high-pressure conditions. In this post we will explore how autoclaves work under the high-pressured conditions of steam and heat to kill microorganisms. We will also look at how the autoclave’s function is similar to a pressure cooker, and what the basic phases of an autoclave cycle are. As we explained in our first post on microbiology, microorganisms need food, the right temperature, and enough moisture to survive and reproduce. So why not just starve them or dry them out? Since microorganisms can survive on tiny amounts of nutrients and moisture, these methods are not effective enough. Moreover, the spore, a kind of bacteria that lives in a quasi-hibernation state, can survive in extremely inhospitable conditions. So if neither of these methods works how can we destroy microorganisms? The answer is heat. Heat destroys the proteins inside of the microorganisms, a process called denaturalization. In order to understand how this works, let’s take a look at the two ways we can cook an egg. If you take an egg, crack it open and drop it into a pot of boiling water, you will cook the egg by poaching it. The white part of the egg starts to stick together and becomes hard, a process called coagulation, which occurs at 52℃. When the egg coagulates, it becomes denaturalized, thus killing all proteins inside the cells of the egg. Another way to cook an egg is to fry it in a frying pan. At first, the egg will coagulate, but if you leave the egg in the pan and let it continue frying, it will all eventually turn black. This burning is called oxidation and occurs at much higher temperatures than coagulation. Oxidation is a chemical process in which electrons are removed from the atom, and the end result is the death of that organism. Steam sterilization, in the form of an autoclave, uses the first method, coagulation, to kill microorganisms. That means that the autoclave chamber acts similarly to that pot of boiling water that poached the egg. The key ingredient that they both share is the presence of steam, or the gaseous state of water. The steam inside the autoclave is the agent, by which the moist heat attacks the microorganisms, thus causing them to coagulate and die. In order to understand how autoclaves use the power of steam to kill microorganisms, we will explore how a pressure cooker functions. The word “autoclave” comes from the Latin “auto” (self) and “clavis” (key), in other words, a self-locking device. The autoclave’s basic functionality is quite similar to that of a pressure cooker, a type of saucepan that is able to cook food 50-70% faster than regular cooking methods. Take some raw food, for example, beans, and place it inside the pressure cooker with water or other liquid, and then seal the vessel with the special locking lid, which includes a round rubber gasket used to seal in the steam. Place on the stove at high heat and wait for the temperature to rise and the steam to start escaping. Inside the sealed chamber the steam will expand and push out the remaining air through the air exhaust valve. Lower the heat and let the pressure cooker continue to cook without touching the valve or the lid. Notice that the air exhaust valve allows some of the steam to escape, so that the pressure doesn’t build up too much, thus preventing an explosion. High-pressured steam, which is a better conductor of heat than air. High temperature heat (above 100℃), which causes the food to cook faster. Like the pressure cooker, an autoclave is a machine that uses the combination of high pressure and steam in order to transfer heat to the items placed inside. Invented in 1879 by Charles Chamberland, the first autoclave was essentially a glorified pressure cooker. And just as the pressure cooker has gone through countless design upgrades in the last few centuries, so has the autoclave. From basic, mechanical machines to fully computerized, sophisticated masterpieces of sterilization, autoclaves have come a long way. Today, dentists, hospitals, laboratories and doctors’ offices use autoclaves to sterilize solid and hollow equipment, supplies, fluids, and waste. And in the chemical industries, autoclaves vulcanize rubber, cure coatings, and synthesize crystals -- such as in the growing of synthetic quartz and gems. Though autoclaves come in a variety of sizes and models, the basic principle remains: harnessing the power of pressure and steam to kill microorganisms. (L) Before sterilization, the bacteria look healthy and strong. (R) After sterilization, the membranes are cracked and torn from exposure to high temperature steam, thus causing the bacteria to die. As we discussed above, the pressure cooker forces the moist heat inside of the food in order to cook it. Imagine that instead of food you had a tray of dental instruments ready to be sterilized for tomorrow’s surgery. Placing them inside the autoclave and running a cycle would force the moist heat into all the possible nooks and crannies on the surfaces of the equipment. First we heat up water to the boiling temperature to generate steam that enters the autoclave chamber. As the steam enters the chamber, the air is removed from the chamber, and continues to be pushed out as the steam expands. The air must be removed from the chamber either by a vacuum process (as in large autoclaves that use a pump or an ejector) or by a displacement process (as in some smaller tabletop autoclaves). Now that the air is removed we increase the temperature and pressure by closing the chamber exhaust valve while continuing to add steam to the chamber. The temperature and pressure will rise to the level required for sterilization. The required temperature is usually set to 121℃ or 134℃. This phase is called sterilization time, or holding time, since now is the time when the actual sterilization takes place. This may take around 3-20 minutes, depending on the size and contents of the load. Goodbye microorganisms! Finally, we cool down the load, making it safe to handle when we open the autoclave door. Don't run out of steam...We're just getting started! Let’s review: we learned that heat, and specifically, moist heat, is the best way to kill micro-organisms. There are two ways to kill using heat, by coagulation or by oxidation. Autoclave sterilization uses coagulation in the form of highly-pressurized steam to denature the proteins inside of the microorganisms. We then compared how a pressure cooker functions to how an autoclave operates. Just as the pressure cooker uses the intense power of steam to force the heat into food, the autoclave also uses steam to “force” steam into the equipment, killing all forms of microbiologic life living on said equipment. And finally we looked at the basic phases of an autoclave cycle, from heating up the water and building pressure, to holding time and cooling down. We hope you’ve enjoyed this introduction into the world of autoclaves. Just be thankful you are not little bacteria experiencing it firsthand. Check out our next post, “Sterilization by Steam,” in which we will explore the science of using steam as a sterilizing agent in the autoclave. If you have any further questions please contact GUNZ Dental customer service on 1800 025 300. 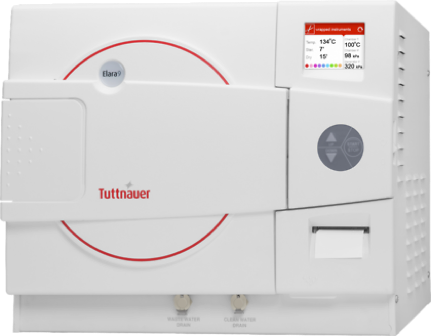 Check out the Autoclave Sterilisation Basics series from the Sterilisation and Infection Control blog by Tuttnauer. Click here to visit the Tuttnauer website for more information!